This example shows the current and possible next solar cycle. For this example we will use the SunPy sample data. 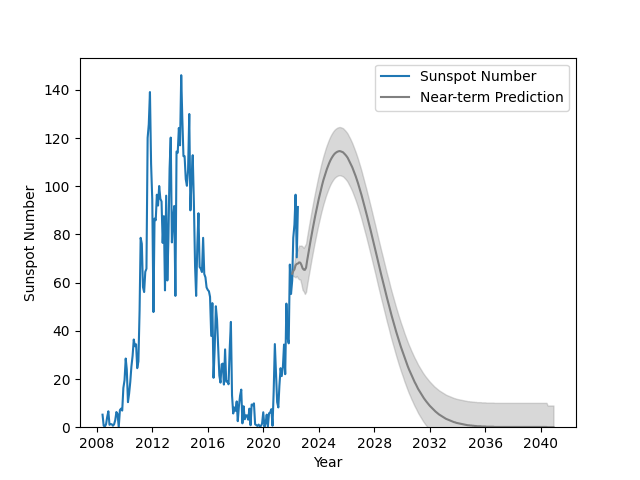 This code snippet grabs the most current NOAA solar cycle data as a TimeSeries (see SunPy timeseries). Next, we grab a new copy of the data and shift it forward 12 years to simulate the next solar cycle. We will also truncate the data to ensure that we only plot what is necessary. Finally, we plot both noaa and noaa2 together, with an arbitrary range for the strength of the next solar cycle.